Whether you come from a background of religious faith or a background of agnostic skepticism, the Cathedral of Christ the Saviour, Moscow, is a sight to behold. The Cathedral of Christ the Saviour, Moscow, is the tallest orthodox church on the globe at 344 feet high. The Cathedral is located in the heart of Russia, on the banks of the Moskva River. It is only a few blocks away from the Kremlin, the headquarters of the Soviet government. The Cathedral was originally commissioned by Napoleon Bonaparte, but its construction wasn’t commenced until several years later, under Alexander I. The building was not disclosed to the public until 1860. For the next 20 years, famous Russian painters were enlisted to decorate the inside of the Cathedral. The Cathedral famously marks to spot of the debut of Tchaikovsky’s 1812 Overture. The Cathedral was modified under the reign of the Soviets to represent the Palace of the Soviets, a monument to socialism. 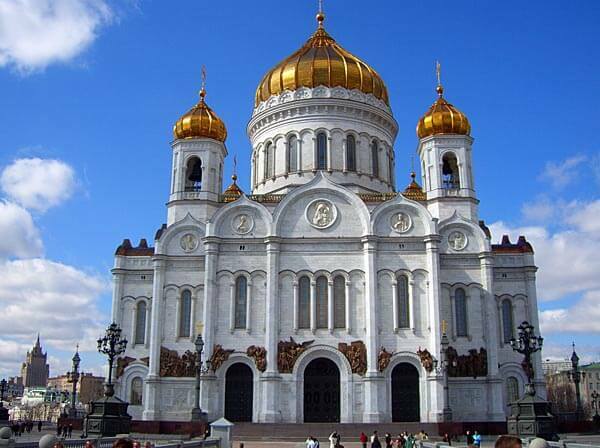 In 1990, however, the Russian Orthodox Church began rebuilding the Cathedral into a religious monument. Today, the Cathedral of Christ the Saviour, Moscow has regained its religious prominence, and Boris Yeltsin’s body was placed there until his burial. The Cathedral continues to possess impressive architecture as well as an historical poignancy that one cannot help but feel upon opening its doors. Open daily 6:30am-10pm. Free admission. Last updated by Marc D. on 23 October, 2011 in Destinations.